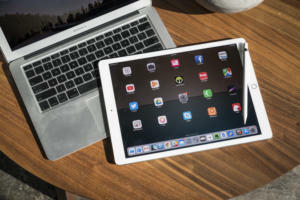 Apple announced that developers will soon have tools to port iOS apps to the Mac. Jason Snell takes a deeper look at this announcement and what it means for the future of the Mac. It was as absolute an answer as you could possibly get. Is Apple merging iOS and macOS? 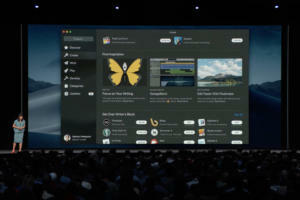 “No,” said Apple software chief Craig Federighi, with an animated accompaniment smashing down on the screen behind him. And yet... Federighi made that comment just moments before he unveiled a new system, being worked on by Apple over multiple years, that will allow the developers of iOS apps to bring those apps to the Mac more easily. And first up will be Apple itself, which is using this approach to translate the iOS Stocks, Voice Memos, News, and Home apps for macOS Mojave, coming this fall. While the Mac and iOS might not be merging, major changes are in store for the Mac and the apps it runs. It’s hard to imagine how the Mac of a couple of years hence isn’t populated with apps sourced from iOS. And yet, Apple says, the Mac will remain the Mac. What does that mean? What will define the Mac in 2020? So for Apple, the Mac is defined by physical attributes, hardware flexibility, and exposed computing power. Some of these definitions are clearer than others: It’s unlikely that iOS devices are ever going to offer modular displays and storage devices. I’m not sure I can entirely conceive of iOS never having a tool like the Terminal—if only because it feels inevitable that app development will one day be possible on iOS—but I can accept that the wild-west feel of macOS, where you can arbitrarily install, compile, and write software, is unlikely to ever be reflected on iOS. It’s a tough position for Apple to be in, because of course the company is never going to comment on future products, but it’s still an open question about whether the border between the iPad Pro and the MacBook is immutable or shifting. Until Apple releases an iOS laptop or a MacBook with a touchscreen—or both!—we won’t know if Apple has decided to re-draw the lines. It’s hard to imagine that Apple would avoid legitimate opportunities to grow the iOS platform just out of fear of treading on the Mac’s sacred ground, though. In a world where relevant iOS apps can be brought to the Mac with ease, what will make the Mac different from iOS will be the flexibility and power that Federighi talked about. One interesting change in this regard seems to be happening on the Mac App Store, where Apple seems to be loosening some of the restrictions that previously forced apps out or barred apps from even considering entry. 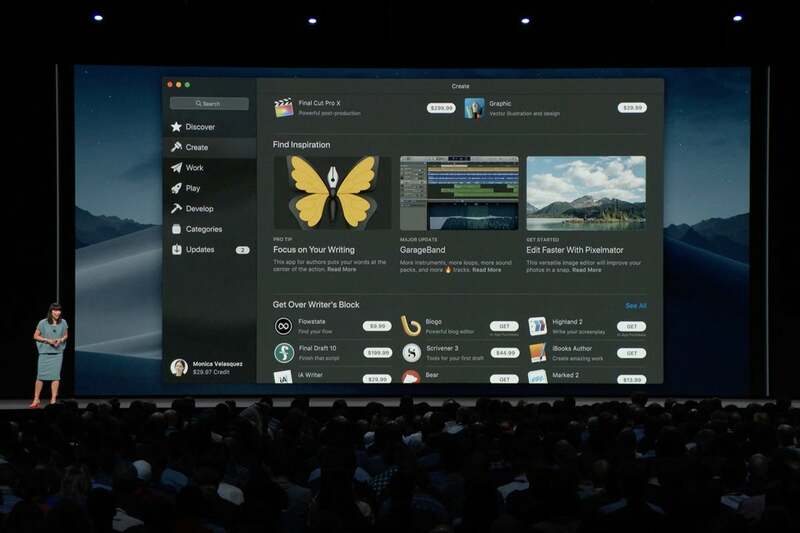 MacOS Mojave will feature a new Mac App Store. In macOS Mojave, Apple has added some new security procedures that allow apps to ask for permission to access information that was previously barred from apps that were sold in the Mac App Store. 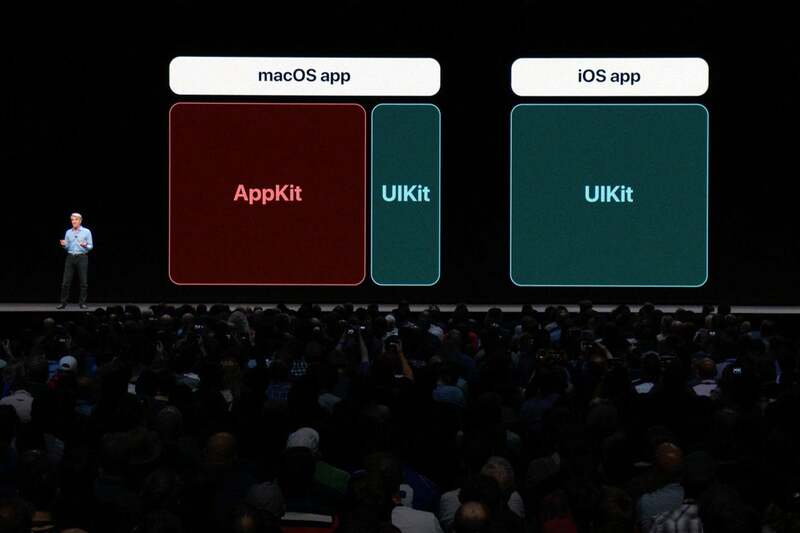 And perhaps not coincidentally, Monday’s WWDC keynote featured several apps that either never appeared in the Mac App Store or departed the store in frustration over Apple’s policies. This is an encouraging sign that Apple recognizes that beyond the potential avalanche of iOS-sourced Mac apps, the Mac App Store needs to be populated with the sorts of apps that aren’t possible on iOS—and that requires more flexibility on Apple’s part. No, a high-end video professional is probably not going to edit a feature film in 4K on an iPad Pro, but they’re not going to use a low-end MacBook either. If iOS is allowed to continue growing and adapting, it’s hard to imagine Apple erecting artificial barriers on iOS just to protect a few sacred areas on the Mac. As a longtime Mac user, I’m excited about getting iOS apps translated over to my Mac—it’s well past time that the Home app appear on macOS. But given the trajectory of iOS, it’s hard not to see this as a temporary approach to making the Mac more useful and viable until the point when iOS itself has the power to accomplish almost anything. That will probably take quite a while, but it feels closer this week than it did last week.